It was August, four years ago, when I first knew. Something’s going to raise itself up from the dark soon, something’s going to get pulled out of the ground, something’s going to be liberated…something. is going. to die. I could almost smell it, but I couldn’t see it. Some elusive thing was pulling on me from the inside. And it hurt. It was a tangled thread, a muffled song, a caged blackbird that only sings at night. THIS THING needed to be brought out into the light of day, so I made the decision to HUNT IT DOWN. Flaming arrow in hand, and equipped with night vision, I danced in the dark with the wounds of my marriage, my creativity, my body, my home, my community. But still, this thing remained. And I couldn’t quite locate it, so I did what I always do when Mystery presents herself. A third Winter came, since that August hunch. And I shut myself into a hermitage. I stayed on the land for close to an entire month, without setting foot in a car, or any place other than my homestead. I broke bread with chosen family. I prayed. I listened. I cooked. I baked. I grieved. I walked with wild coyotes. I wept on my knees in the snow, again and again. And, it’s taken me more than half a year to STAND UP again because, THIS. …A shimmering golden thread that MUST be woven into the fabric of a movement. A song that I’m learning to hear ~ the sweetest melody of the most incomprehensible beauty, sung by a bird who’s taking broken wings to flight. THIS, I care about almost more than anything in the world. THIS is a purpose, a promise, a thing to live for. A holy realization. A revolution. Maybe you’re thinking, ‘of course’. Until this changes, I promise. I will TAKE A STAND. With shaking knees, I’LL STAND AND SING above the grave of the thing that I could smell decaying, August, four years ago. It was my own silence waiting to die. I want you to know that I AM HERE. I HAVE A VOICE, and I will use it for good. 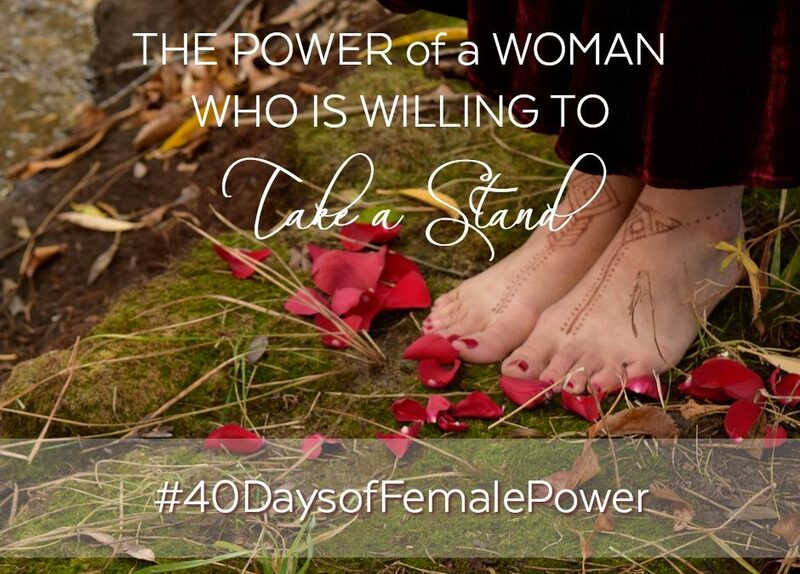 And so, #40DaysofFemalePower is Born. Bearing witness. Thankyou for including me. as I lie here awake at 2:08 AM thinking to myself …. no one should be left with their own thoughts alone at night. I read this short essay now thinking everyone should be forced to feel their own thoughts alone at night in the dark while the coyotes circle the house hungry and waiting. day 40. how many days is a lifetime? maybe a lifetime comes down to one monumental moment when you wake to realize this shall be no more as you find your voice and take back your joy realizing you aren’t afraid of anything any more . I want us to reframe the languaging of our uprising. I see the importance of focusing on “The Feminine”, not on the female gender. That which is creative, nurturing, caring, cyclic, inclusive, softer, circular… for the greater good…. that force that will heal the gender-based atrocities and injustices perpetrated by men against women and against our mother planet… that is feminine and that is what matters. Feminine power matters. And that power, that perspective, must come from all our hearts, not just women. That force MUST rise in every heart in order for us all to survive what we have done to each other and our planet. And women must take responsibility for our part in empowering the patriarchy. It would be a mistake to think that the solution for our time is gender-based. I believe that what we are feeling is the uprising of the feminine in the cosmos, in the sentient planetary mother, in nature, in all of us. This is the thing to be dedicated to. This is the stand I take. I say SHE IS rising! I am standing with you in THIS. I too have just spent a month in silence on retreat in South Africa and felt the presence of the land speaking to me so strongly. I am not sure what is going to emerge in my life, but I have declared that I AM WILLING. I have also declared that I will be part of STOPPING THE VIOLENCE that is so endemic on our earth – again I don’t know how yet. I will also use my voice for THIS. Welcome Beauty. Unsure as to how I was lucky enough to be blessed with this deep , honest, magical post, but it mirrors my lifelong work/play of co-creating Woman/Earth honoring ritual circles. How inspiring, how affirming to witness the steady spiraling spread of this empowered Woman-consciousness. Carry on! Thank you for sharing this always powerful realization, to germinate again and again in our bodies and our souls. I am with you. More than fantastic. I hear you speaking from so deep, knowing, through you, to earth. Powerful. And yes!!! Wow. Perfect. Powerful. Thank you. I too feel this way, sister. But how do we make this change? To awaken women’s power, to bring back the respect and honor for all women. Wow! Awesome! thank you for doing the work. I witness you. I’m with you. Well maybe behind you… I’m doing the work, slowly, to find my voice. My spirit quickened as I read, yes I feel you, I stand up with you For Woman Matter dearly. Thank you, I am here, I am here standing with you and for us all. Thank you , miles de gracias India por estas hermosas palabras y este re inicio.